If a horse has a hock injury or bed sore, repeated lying down can aggravate it and prevent healing. Some sores just become larger and/or deeper. The healing process cannot take place unless a protective layer is placed between the ground and the skin. Go to About Us to see how this hock looks today. 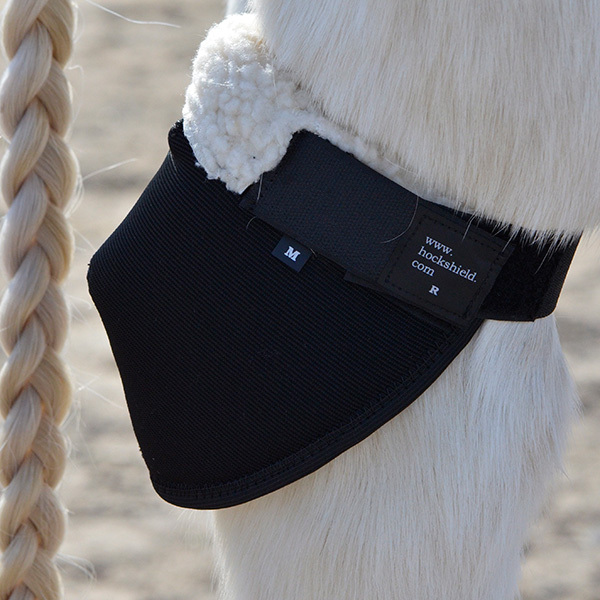 The Hock Shield is a custom fit hock protector designed to STAY IN PLACE to prevent and heal hock sores. This light weight, non-restrictive boot is made of ultra-thin neoprene to provide that constant barrier your horse needs. The Hock Shield and the Hock Shield Ultra come in two adjustable sizes for the perfect fit. Do they really stay on? YES! Both hocks are completely protected and the Hock Shields stay in place while getting up. We stand behind our product so if for any reason you are not completely satisfied, your money will be refunded. Hit the Product Info tab on the menu bar above to read Hock Shield user “Testimonials”. I was desperate for a solution to my problem – protection for my horse Taboo’s hock. Having an arthritic left front knee, Taboo needed to use his back left hock aggressively to lift himself from a prone position, resulting in a nasty, nearly bone-deep hock sore. Consultation with my vet left me in despair. I was told there was no hock boot that was worth buying. However, I chose to buy every hock boot I could find online, in catalogues, and at the local feed stores. Nothing worked…they all ended up around his ankles within a few hours. I started using Hock Shields and Taboo wears them 24/7 (except for trail rides and play time in hand). He is now living happily ever after with healthy hocks! Thanks so much. We love the hock shield for our older pony with arthritis. I feel like he finally has some comfort and the sores are all healed up (I tried so many other things). I am getting a second pair, not because they have worn out, but because he chooses to lie down in his urine spot and they are always still wet by the time he comes in again. Hoping alternating will help! Thanks again for such a great product! My beloved 24 year old gelding, Clancy, has been getting terrible sores on his hocks. Every morning I would go out to find blood running down his hind legs and any attempt at bandaging failed. Since I started putting the Hock Shields on him every evening, no more open sores. There is even hair starting to grow back. Awesome product! I've used about everything imaginable on my paint horse and this is the first thing to work. Got my Hock Shields at the end of last month. I use them only at night. One hock is nearly healed and the other has a little bit to go yet but I'm extremely happy with this progress. I bought them three weeks ago, they are wonderful! I've already told several people about them because we have been waiting and waiting for a product like this. My horses' hock sores have already cleared up. I can’t tell you how much I love theses hock boots. You have just saved my horses’ lives. I’m so excited. The best thing I have ever found. Their hocks are almost healed, one is completely healed and the other one is healing rapidly. They stay on really good. I had them slip down once but we are putting them on really cautiously and not putting them on very tight. Just wanted you to know how excited I am about your product. I am going to tell everyone that I can at the horse shows where my horse got the sores. After struggling with a hock sore on my Friesian for weeks- that turned into several months- I finally found your website. I was able to pick up a set of XL/Draft shields at my local Big R. I measured him according to your photo guide and the fit was perfect. Even better, he doesn't mind wearing them at all. (Sure beats wrapping his hock several times a day then adding a shipping boot at night. He HATED that) I've played with the fit and found that I am able to make the fit even a bit looser than two fingers, which I like as I know I'm not causing any discomfort or damage. After using them for about a week I am so thankful that he is finally showing significant healing. I did add an under-bandage at first but now that it has a healthy scab I find that the fluffy lining doesn't wear or interfere with it at all. Thank you!! I will be recommending your very fine product to my friends. 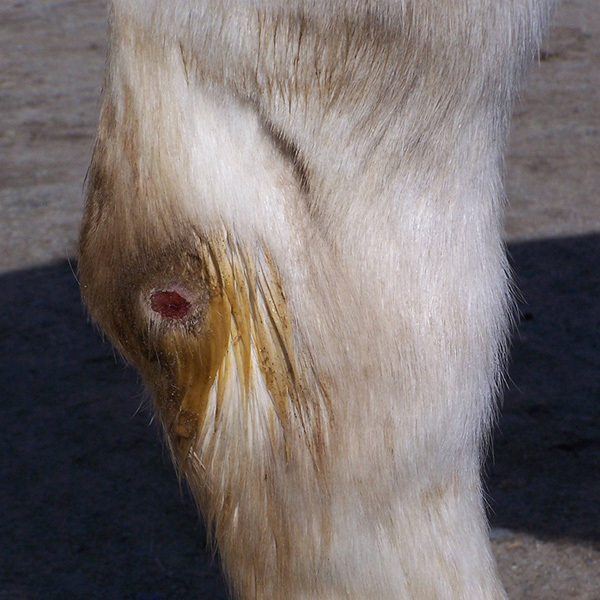 Several horse owners complain to me about non-healing wounds on the point of the hock. 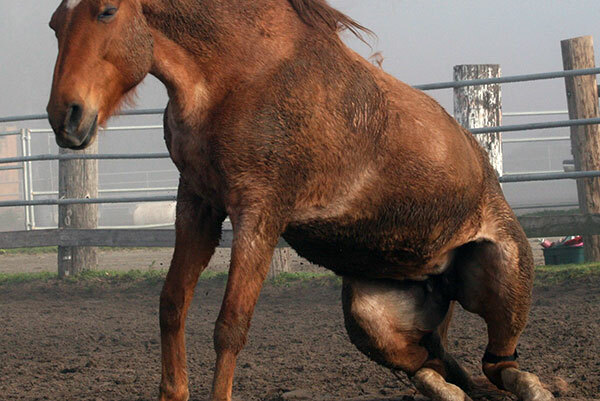 These common wounds are created by repeated trauma when horses stand after laying down. In the past, I have found these wounds very difficult to treat. I have tried a variety of medications and bandages with little success. I began recommending Hock Shield boots to my clients and was blown away by the results. Horses that had chronic, bleeding sores healed completely within a couple weeks. Owners found them easy to use and durable. I highly recommend Hock Shield for any horse dealing with this issue. The Hock Shields are amazing – what a brilliant invention. I just placed an order for another Hockshield to have as a spare. My TB gelding developed a hock sore from rolling outside on frozen ground and then kept opening it up when he would lie down in his stall at night. He is well bedded on pellet bedding and his stall is always very clean. I tried everything I knew to heal the sore and nothing was working. I gave up and did an Internet search and found your product. It works just as you say. I had only one episode of it slipping down on the second night he wore it and it has stayed in place every night since. The sore is healed over now with just a small callous/scar showing and I could not be happier! I am sure Miles of Smiles (Smilie) is happier, too with a pain free hock. These are the only things that have helped my horses sores heal because his hocks are now protected from rubbing the ground when he sleeps and gets up. Thank you for creating this simple but wonderful product. My elderly thoroughbred is out 24x7, you'd indicated these should stay on and they sure do! Well, he does occasionally slip one off, but 99% of the time they do stay on and in place. The fetlock shields are the best I have ever encountered. They stay in place to do the job nicely. Fabulous products, both of them!! Thanks so much for creating these and my thoroughbred thanks you. I love these things!! Love your product, they have helped my big guy quarter/draft hocks so much. They were in such bad shape I felt guilty to take him anywhere and that I wasn’t able to make him feel better. Will be ordering some more today!!! For years my 20 year old has developed hock sores off and on. Because of his age, and arthritic changes that have increased, he now lays down much more, and the last year, his hock sores were becoming troublesome to get ahead of. They were struggling to have any healing time between bouts. Then I found your hock shields. They have been a literal lifesaver. The hair is almost completely grown back on his hock, and you can tell that it has alleviated a portion of his discomfort. THANK YOU SO MUCH for this ingenious product. We will be forever grateful, as I'm sure it has contributed to allowing us to have more days with our special boy. I ordered some hock shields from you about two months ago. You may remember because I had you overnight them I was in such a state of distress. I've loved mine. They do rotate sometimes, and I've had to get very precise about how snug to put them on....... but they have healed my horse's hocks. I wish I'd taken before and after pictures because it was UGLY!! Just wanted to tell you how happy we are with your Hock Shields. Our Warmblood filly is "horse-tall" but still sleeps like she's a foal, on the floor of her stall. We have rubber mats and no matter how much bedding we put in, her hocks developed sores that could not heal as she reopened them every night. We purchased Hock Shields for her and in less than a week, the wounds are dried up and have shrunk to almost nothing. By next week, they should be gone altogether. They stay on and in place all night and are easy to put on and off. I've washed them in cold water, gentle cycle and dried them on low heat. They came out fluffy and clean. Great product! I'm telling all our fellow horse-keepers about them. Thanks! Wanted to let you know that your Hock Shields have been a big help to my gray horse Raider. Two years ago Raider came up lame. He was diagnosed with a fisher fracture, stress fracture and a small chip from a birth defect that went undiagnosed all in this left hock. We injected him along with acu-scope and laid him up for a year. We were told that he might come back as a trail horse. Raider has fully recovered and has come back as a heel horse, which is what he was before he went lame. What I also did when he started his recovery was to use your Hock Shields. 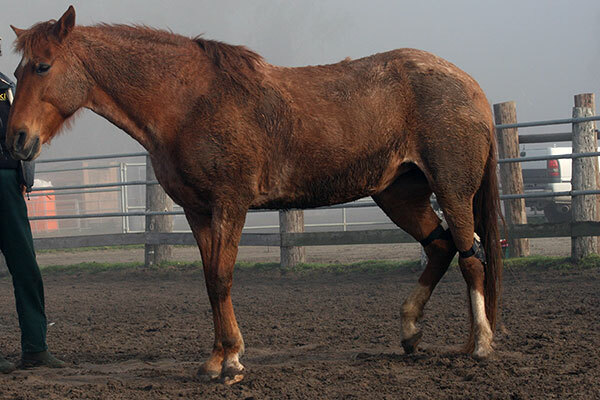 He no longer had sores on his hocks, which in turn helped speed up his recovery time. Man if I only knew of these 6 months ago. I'm so happy with them it makes me want to put up a brochure at all of the local feed store bulletin boards. So many horse owners have the problem and here we have vets saying ' oh there's nothing you can really do'. I've tried everything. Since I got them Saturday, my mares sores went from gross puss oozing sores to half the sized and dried up. And I cleaned them daily. But I can't keep her from laying down at night. I am so going to show them off proudly! The Hock Shields that we purchased for Sparky were fantastic and stayed on perfectly and were so comfortable for him. I will certainly recommend Hock Shields to all our horse owner friends as they are far superior than any products offered in the UK and they never fell down once. I have an 18 hand 1800 lb Belgian draft horse and we have always struggled with hock sores. It's insanely frustrating because I have tried literally every thing you can imagine. I even went as far as using surgical glue, to glue a strip of neoprene over the sore because no wraps would stay on. I spent hundreds of dollars on medicine and wraps, all to no avail. I felt horrible and didn't know what to do. When I got the hock boot I was immediately impressed with the simplicity of it. The best part was, it actually stated on! For the first time I had a product that actually stayed on and the healing could begin. Over 2 months the wound went from being about 3 inches wide to the size of a quarter. Now it is completely healed, I keep them on now as a preventative measure. It is the most important piece of medical equipment for my horses I own. Thank you soooo much for making this amazing product! Thank you so much for these great hock boots. My 23 year old Anglo Arab had horrible sores on his hocks. Your boots have helped so much. I am glad I bought 2 pair. They are fantastic. I spent over $100 on bedding that didn't work. You have a great product. They completely healed the sores on my beloved arthritic horse, and she is much more comfortable now. They also stay up really well. Before finding them on the internet, I had actually used baby diapers, which worked marginally well, as you can imagine! After researching hock boots and discovering your hock shields online, I am so happy to say that they have been so completely AWESOME for my young horse. He was in a bad way with his hock sores, and these boots have been so wonderful, I cannot thank you enough! They even stayed put during a good gallop with exuberant bucking when he was turned out in one of the big arenas. I recently ordered a pair of Hock Shields for my 20-year-old Percheron. He has only been using them for a week, but what a difference!! 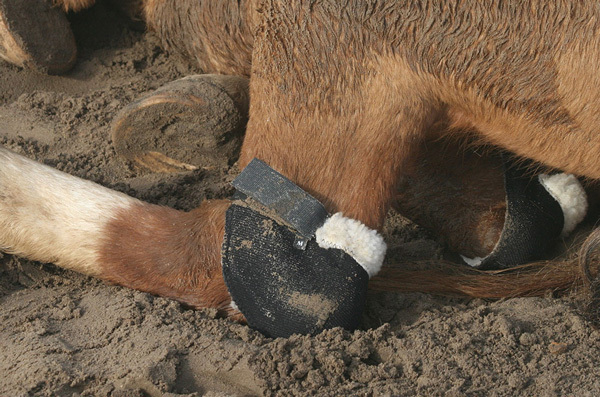 His hocks are already healing and not being re-injured when he rises after rolling or lying down. I ordered a pair of hock shields for my horse and so pleased with how easy they are to use and how comfortable they are for the horse. His hock sore looked so much better even after just a few days. Their customer service is amazing and they already got another customer from my barn due to my recommendation of their product. Thank you for this great solution! Thank you so much for designing such a wonderful product! 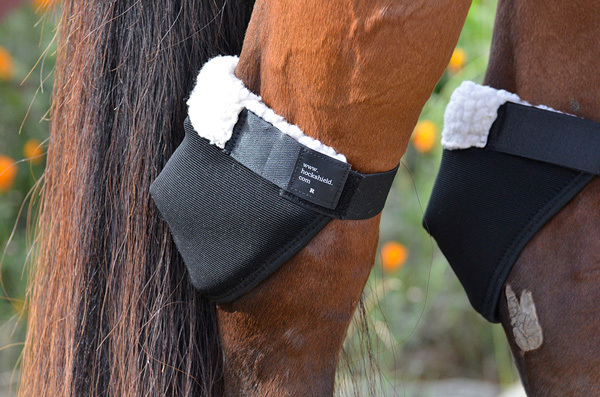 I've been using the Fetlock Shields on my Quarter gelding for a week now and they are fabulous! I've used a couple of other brands and yours are superior for a couple of reasons. First, they are very user-friendly by being easy to put on and take off and second, they are the safest that I've used. The others had straps across the back that goes right over the tendons on the back of the cannon bone and I was constantly worried that they were either put on too tight or would get twisted while on and "cord" his tendons. I am impressed by the strength of the material on the outside and the padding in the center and smoothness of the lining, plus the fact that they don't "slouch" down his pastern. Thanks again for creating this unique and functional item for our beloved horses. I just wanted to send you a note to say thank you for making such a wonderful product. I recently moved my horse outside to be in a 50X50 versus a stall paddock. Even though I bed his sleeping area he chooses to sleep in the dirt! Thus he developed pretty nasty hock sores. I tried different hock boots but because they wrapped around the entire leg he thought they were torture devices and refused to walk in them. A friend sent me the link to your product which I promptly ordered. I was pleased the first day I put them on because my horse didn't mind them at all. The product stays in place and within the first week things are looking better. It will take a while for his sores to heal up because they are very large and deep - but for the first time I have hope that they will actually get better! We are sponsoring a class and will have a booth at the California Dressage Society Finals event at Rancho Murieta Equestrian Center in Rancho Murieta, CA September 21-24. Please stop by and say "Hi" and pick up your Hock Shields at event pricing. Many of our customers have requested new elastic straps because their Hock Shields still have more life in them but the elastic and velcro on the strap are worn out. You can go to the "Order" tab and select Replacement Straps. They are just $5 for a new pair.